It’s our belief that confidence comes from repeated experience; skills come from repeated practice. Transferable skills come from an understanding of how something works rather than just knowing what button to push – allowing you to apply your learning to new situations and systems. So why do your Comp Crew course on a boat like Amelie Rose? Modern yacht designers seem to spend an inordinate amount of time trying to hide the very systems that make a sailing boat operate. Sometimes I wonder whether they’d hide the sails too if they could only work out a way. 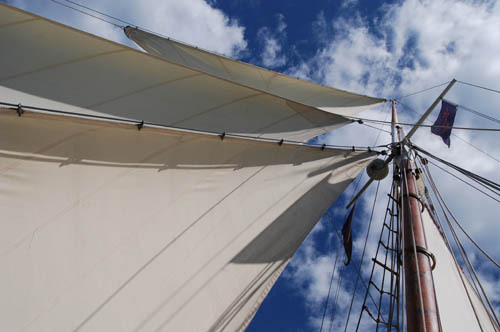 Halyards disappear inside masts (as often do sails when furled), topping lifts and other control lines vanish into comings and even sheets are sometimes banished to gantries above the cockpit. Meanwhile aboard a traditional boat everything you need to control the boat is right there in open sight. Want to know what that rope does? Grab it, waggle it a bit or even give it a gentle tug. See what else moves, Ah! There you go, that’s what it does. Being able to see the whole of a system makes it so much easier to understand what is actually happening. 2. They’re a knot-tiers paradise. 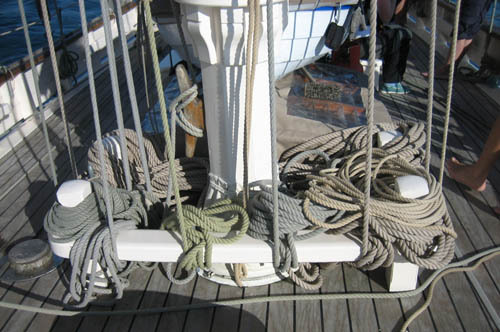 There’s a reason for every one of the 8 knots on the RYA Syllabus. Each one has purposes, strengths and weaknesses and yet aboard a modern yacht the chances are you’ll regularly use only 3 of them. What you don’t use you will forget and so when it comes to the time that you need to tie a rolling hitch in a hurry you’re going to come up short. On Amelie Rose and other traditional boats you’ll be tying reef knots when we reef, rolling hitches to transfer tension from various lines, sheet bends to attach lines of unequal cross-section to each other and round turns and hitches when we moor up to a quayside. As an added bonus you’re also going to learn to tie a lightermans hitch (for securing the main sheet amongst other things) and no mainsail ever gets properly stowed without the use of the good old slippery hitch. 3. They’re very forgiving – when you do the job right. Amelie Rose weighs in at a hefty 24 tons and spreads over 1750 sq feet of canvas to propel her up to her hull speed of 8.5 knots. And Amelie is fairly small for a Pilot Cutter. Twenty-four tons makes for a very stable working platform (relative to an equivalent modern 44 footer weighing in at around 10 tons). What this means to you the crew is that you spend less time worrying about staying on board and more time working the boat and learning stuff. It means that popping down below to go to the loo happens when you want to – not when the boat finally makes it to calmer waters. It means making a cup of tea for everyone is a nice way to get out of the wind for 5 minutes rather than a quease-inducing exercise best suited to someone with gecko-pads on their hands and feet. It also means that you learn to control the boat with ropes, cleats, bollards and fenders when mooring because you’re not simply going to lean out and pull this girl into the berth with a boat hook – not on your nelly. You’re going to learn to control the rig with just rope and tackle – all that sail dropping exactly when you want it to using nothing but a turn around a belaying pin to take the tension. A busted winch won’t be a bother to you because you’ll understand the principals involved in managing a much bigger rig with nothing but some blocks, some rope, someone to sweat and someone to tail. 4. Jobs need teams not loners. While we’re on about sweating and tailing (the process by which a team of folks tension up a line) it’s a good time to talk about the differences in the level of team-work involved in working a traditional boat versus the modern equivalent. Modern boats replace the need for a team of folks to work together by introducing powerful machinery such as winches and geared (or even motorised) windlasses that are often operated by a single crew. In contrast weighing anchor aboard Amelie Rose is a 3 person job. Raising the mainsail usually keeps four crew occupied for a good 10 minutes. Learning how to work together with your crew-mates is not only good for your soul but also gives you the skills to get the job done aboard any boat when all that fancy modern gear breaks down (as it does). 5. There’s more to do. With up to five sails to hoist, trim and drop again and some 36 ropes involved in controlling it all there’s no shortage of jobs to be done. That means lots of repetition of those skills and techniques that you’re trying to learn. With a modern teaching boat once the main and jib are up there’s very little else to do until it’s time to pack it all away again. The advent of self-tacking jibs mean that even a good beat to windward can leave a crew twiddling their thumbs for want of a job that needs doing. Tacking Amelie Rose is task that’ll keep five crew members fully occupied – each with a key part to play in the successful execution of the manoeuvre, and that’s whilst flying only her basic suit of 3 sails. 6. Interesting waters, interesting weather. If you only ever intend to sail in the relatively tide-less and balmy waters of the Mediterranean well, fair enough. But for many of us part of the appeal of sailing is the adventure of taking our little ships to new places, seeing new vistas, experiencing new cultures. Unfortunately some of the most interesting of these have tides, strong winds and occasionally somewhat shirty weather. As it happens the South coast of the UK can offer all of this, especially in the Spring and Autumn when we run our RYA courses. Even though nearby Bournemouth offers the most sunshine hours of any UK city, we also get plenty of more interesting weather – usually in thankfully short doses. The Solent also offers tidal streams of up to 5 knots and a tidal range that can leave you parked up a beach or hanging off a harbour wall. It’s often said about the UK that “if you learn to sail here, you can sail anywhere”. 7. We’re holiday providers not mass-market sailing schools. 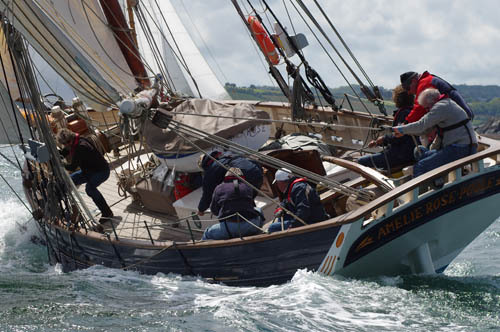 The vast majority of traditional boats out there offering RYA training courses are also skippered charter holiday vessels like Amelie Rose. What this means for our trainees is that your accommodation will likely be of a higher standard than many school-boats and aboard Amelie Rose at least the food will be better too as we’re used to having guests aboard enjoying their holidays whose idea of good grub does not include reheated ready meals or Fray Bentos pies. There’ll often be a good deal more space aboard than on a typical 36-40 foot school boat too. Amelie Rose can sleep up to 11 but there’ll never be more than 6 folks aboard for the RYA courses that we run meaning lots of room to move around, stow your stuff and space to spread out a bit in the evening. So there you go – essentially what we think is it’s a better way to learn, because when you learn aboard a boat like Amelie Rose (and learn you will – we’ve never failed yet to get anyone up to the Comp Crew standard) every other boat will seem like a doddle. What do you think? Let us know in the comments below. 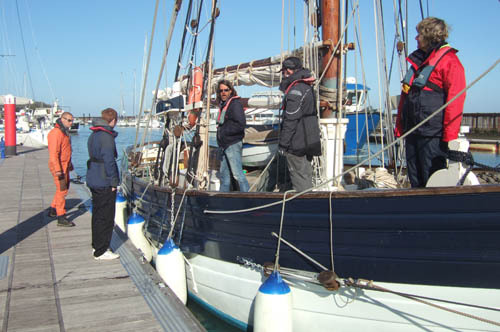 Inspired to come along on a Competent Crew (or Day Skipper) course? Why not check out the dates of our courses?